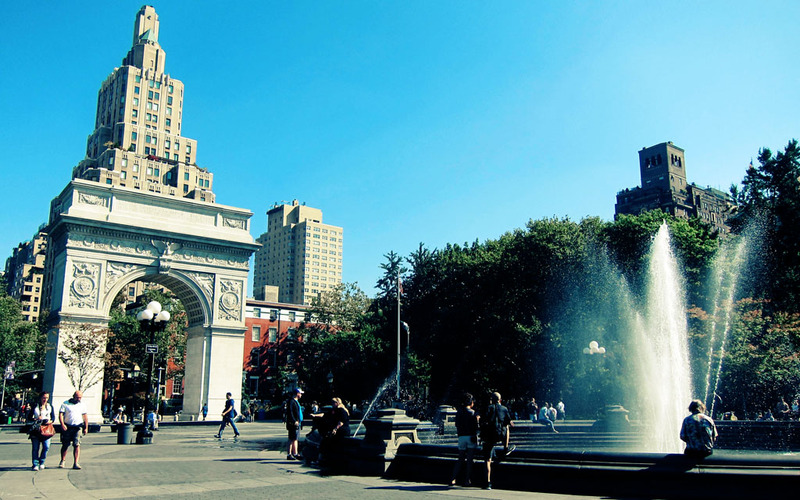 Washington Square Park is a beautiful green space located in the vibrant heart of Greenwich Village, amidst gorgeous brownstones, NYU buildings, specialty shops and small bistros. The park is a popular spot to stop, sit on a bench, read a book and people watch for residents and visitors alike. 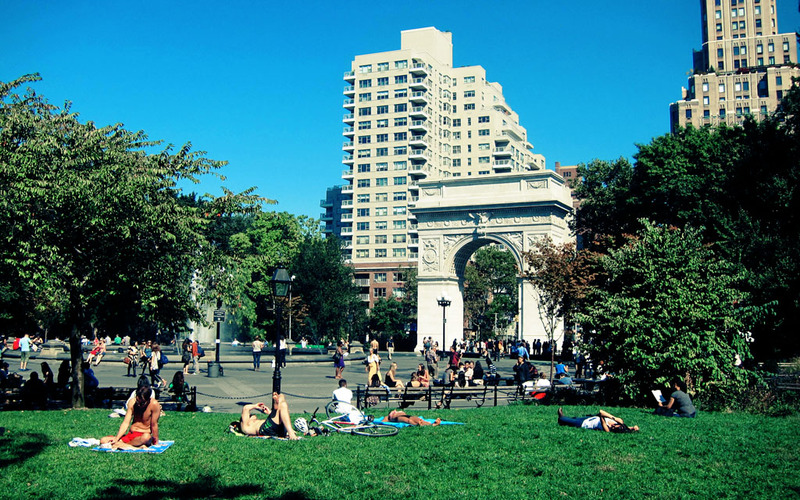 Indeed throughout the day the park’s benches are packed with resting tourists, studying NYU students, lounging locals and interesting New York characters, while the lawn is strewn with picnickers and sunbathers enjoying the Sun’s warm rays. 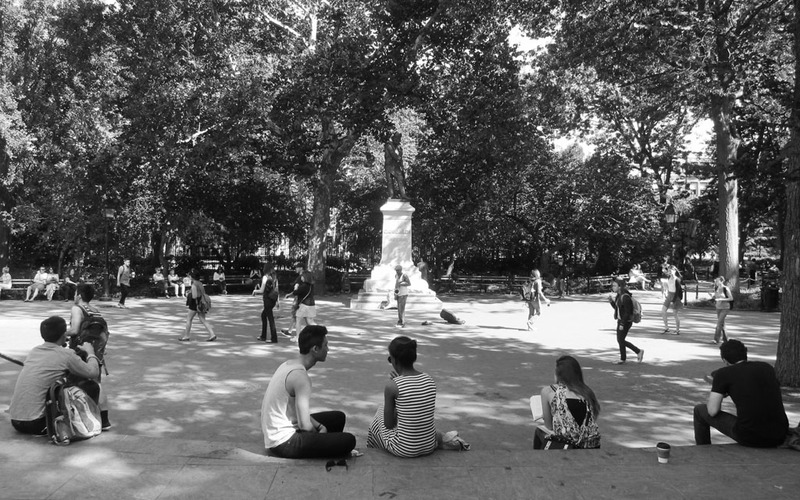 Not only does Washington Square Park offer a leafy, open space where one can find relief from the busy and often crowded streets of Lower Manhattan, it also provides visitors with a wide range of entertainment, intentionally or otherwise. There are talented musicians, guitar-strumming buskers, aerobatic street performers, inspired artists, fearless squirrels and of course the resident pigeon feeders (who are for the most part covered from head to foot with a brood of hungry and pooping pigeons) entertaining passers by. As well as that there are food carts, playgrounds for kids, fenced areas for dogs, and on the west side of the park there lies a battlefield for chess enthusiasts. There really is something for everyone at this neighbourhood park and as such it remains a flurry of activity, no matter what time of year it is. The park was not always like this though. In fact, this particular plot of land has a long and rather sordid history. Starting life out as an estuary, the marshland was transformed into a burial ground, then to an area where public executions took place, and then a military parade ground before it officially opened as a public park in 1827. There is little mention (in the form of monuments or plaques that is) of these former times, so generally visitors walk around the grounds blissfully unaware of what went on. There are however two prominent features of the park which get a lot of attention, they are of course the central water fountain and the Washington Square Arch. The marble arch, which was built in 1892, honours George Washington (the man after whom the park is named) and has appeared in countless TV shows and films. It also nicely frames 5th Ave and the Empire State Building off in the distance (not captured here), which makes for an excellent photo.